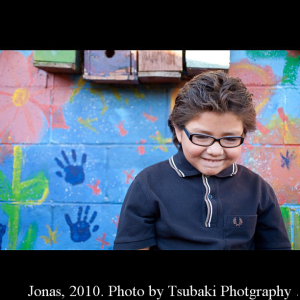 Jonas began volunteering when he was just 4 years old by feeding homeless people on Skid Row with his mom and aunt Janet. It was just 2 short years later that he decided to take it one step further and start his own organization to benefit homeless youth. 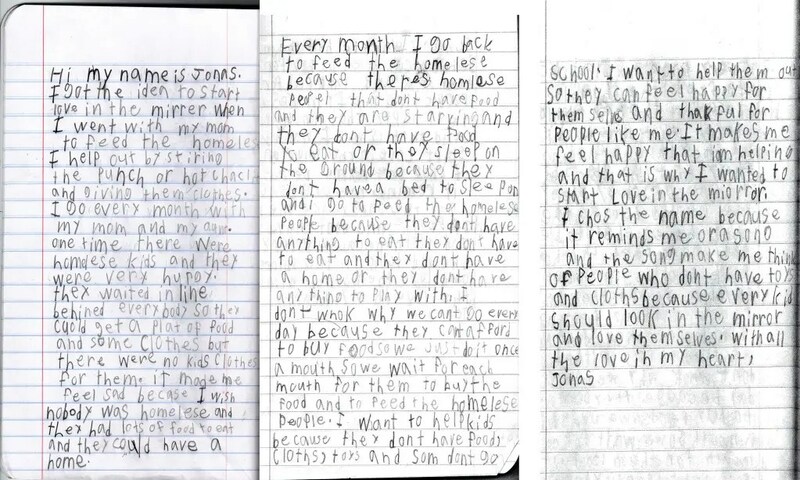 Since then, Jonas has helped over 7,000 people with basic necessities like food and clothes. He has organized drives, picked up donations, spoke in front of hundreds of people and inspired everyone he meets. Along with running his own organization and helping thousands of people, young Jonas attends the local bilingual charter, New City where he will be entering the 4th grade in the fall of 2012. He spends the rest of his spare time playing tennis under Valter Paiva at the Billie Jean King Tennis center in Long Beach, and piano with his music teacher Jewel. Jonas is a strict vegetarian, loves to draw, play with his brother, cousins and friends, and enjoys being part of a traditional Aztec dance circle. Jonas believes that everyone can make a difference no matter how old you are or where you came from. Why was Love in the Mirror started? Hi my name is Jonas. I got the idea to start love in the mirror when I went with my mom to feed the homeless. I help out by stirring the punch or hot chocolate and giving them clothes. I go every month with my mom and my aunt. One time there were homeless kids and they were very hungry. They waited in line behind everybody so they could get a plate of food and some clothes there were no kid’s clothes for them. It made me feel sad because I wish nobody was homeless and they had lots of food to eat and they could have a home. Every month I go back to feed the homeless because there’s homeless people that don’t have food and they are starving and they don’t have food to eat or they sleep on the ground because they don’t have a bed to sleep on and I go to feed the homeless people because they don’t have a home or they don’t have anything to play with. I don’t know why we can’t go every day because they can’t afford to buy food so we just do it once a month so we wait for each month for them to buy the food and to feed the homeless people. I want to help kids because they don’t have food, clothes, toys and some don’t go to school. I want to help them out so they can feel happy for themselves and thankful for people like me. It makes me feel happy that I am helping and that is why I wanted to start love in the mirror. I chose the name because it reminds me of a song and the song makes me think of people who don’t have toys and clothes because every kid should look in the mirror and love themselves.